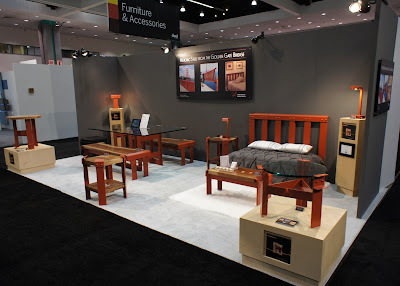 Last month we hit the road and exhibited at Dwell On Design in Los Angeles. We had a great time meeting people at the show and looking at all the beautiful and creative products on exhibit there this year. With so many awesome and innovative designs to consider, we wish to thank Jaime Derringer over at Design Milk for including us in her Favorites from Dwell On Design 2013. To see more photos from our Dwell On Design booth, we invite you to visit our album up at our Facebook page or at our Flickr page. At the Dwell event, we premiered a couple of modified designs as well as two new designs. 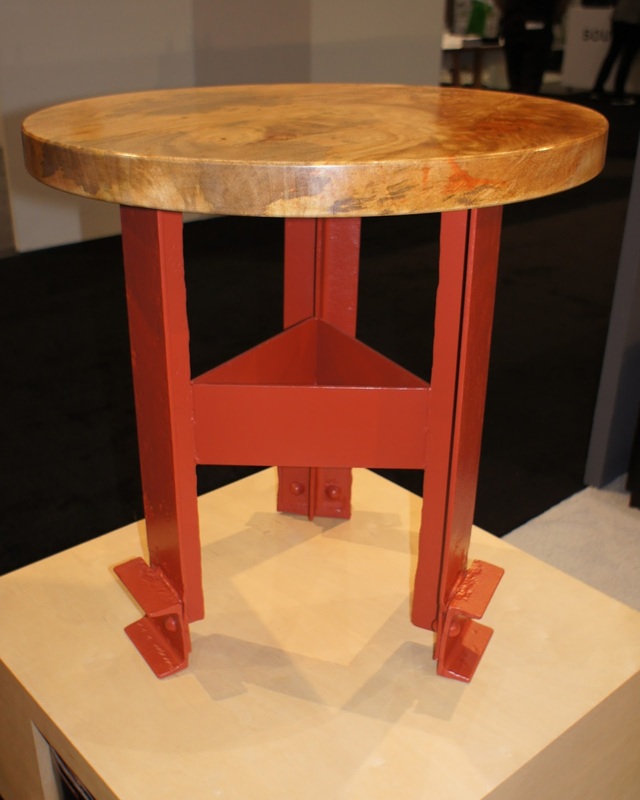 As we continue to explore the use of wood with our historic steel pieces, we were excited to show modified versions of our Side Table and our Coffee Table designs with salvaged wood table tops. 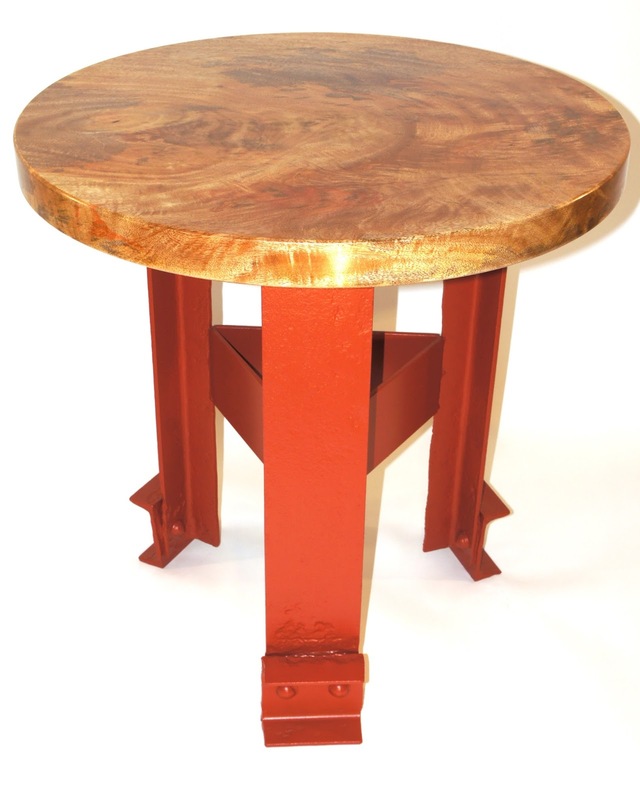 Above is shown our Side Table design with a table top crafted from a salvaged piece of Mango wood from Hawaii. 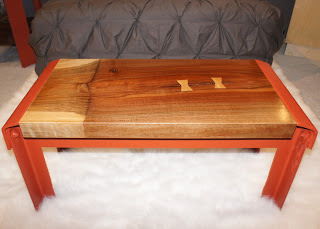 Above is shown our Coffee Table design with a salvaged piece of Claro Walnut orchard wood. If you look closely, you will see the graft line where the two species of walnut were grafted and grew together. A common practice in our local area orchards, since English Walnut had a higher nut yield and thinner shell, but it didn’t fare as well in the California climate, English walnut was grafted onto root stock of native California Walnut. Where the two species met and grew together you get the graft line showing two distinct wood grains, lending character to what would normally be a standard piece of Walnut. Newly introduced at the show this year was our Table Lamp. 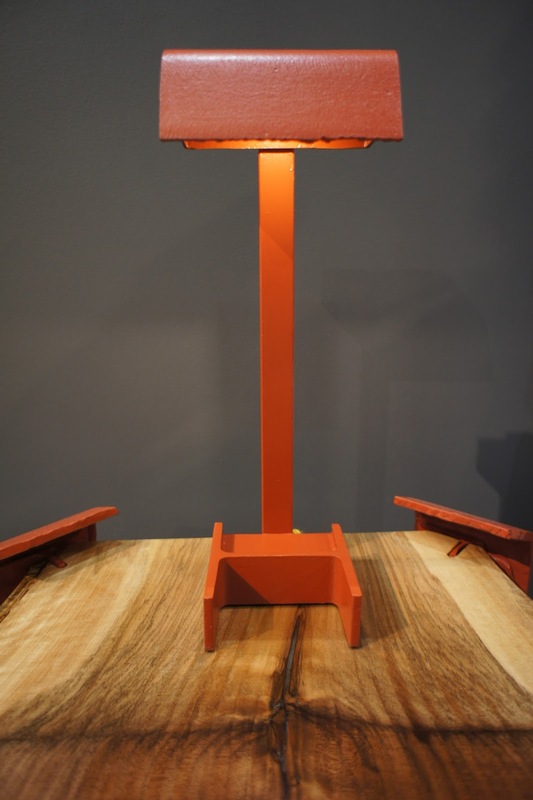 The Table Lamp is similar in size to our Task Lamp design, and it uses the same LED lighting technology. 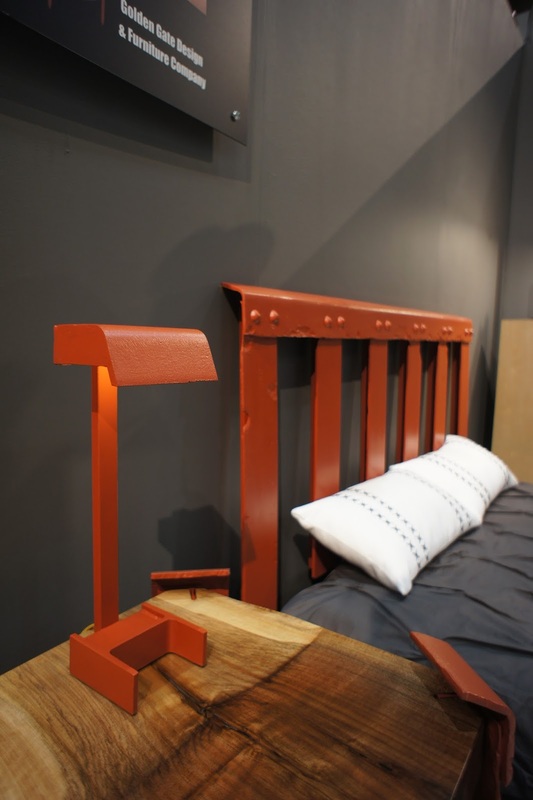 However, the Table Lamp incorporates a clearly recognizable piece of weathered handrail cap, differentiating it from the more abstract look of the Task Lamp. 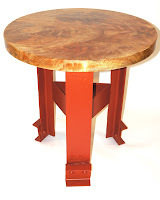 Also introduced at the show this year was our new Tea Table. 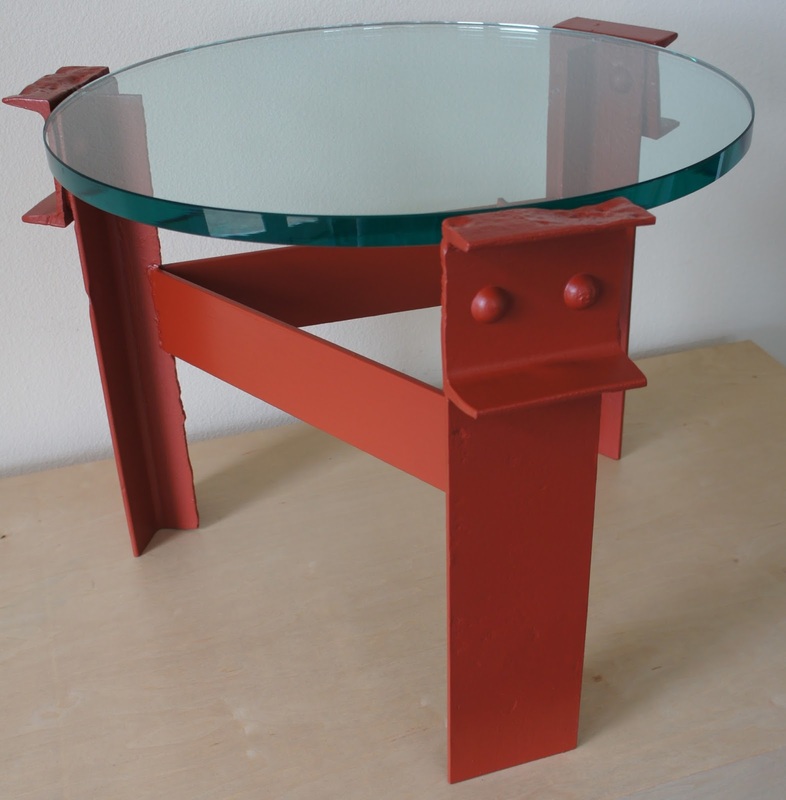 The Tea Table is similar in size to the retired Accent Table design, but like our Side Table design, it incorporates the handrail channel beam that runs along the base of the historic pedestrian handrail. Thank you to all who came out to see us at the show and helped us have a great experience.